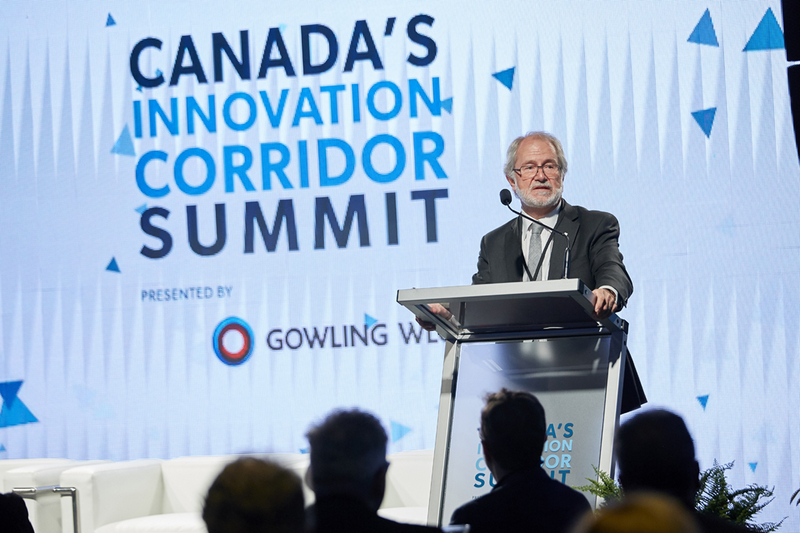 Canada’s Innovation Corridor Summit held earlier this year in Hamilton-Burlington featured opening remarks by Patrick Deane, President of McMaster University, a valued event sponsor. Industry Focused: Colleges and universities across Canada’s Innovation Corridor play an essential role in the growth and development of industry, the foundation of the global economy. McMaster is Canada’s leading university in terms of research funding from industry. These investments engage faculty members keen to help tackle complex challenges and students eager to apply classroom learning in workplace settings. Most important, research partnerships offer industry stakeholders solutions to real world problems in areas ranging from technology and talent to productivity and public policy. McMaster’s commitment to industry partnerships that support human and societal health and wellbeing is evident in its leading centres of excellence, including the McMaster Manufacturing Research Institute and the W Booth School of Engineering Practice and Technology in the Faculty of Engineering. Partnership Driven: McMaster University is a founding member of Canada’s Advanced Manufacturing Supercluster, a business-led partnership devoted to accelerating the mainstream adoption of Industry 4.0 technologies and processes. It has teamed up with other top institutions of higher learning in Southern Ontario — including the University of Toronto and University of Waterloo — to provide manufacturers and technology firms access to an “innovation system” that spans municipal boundaries and leverages specialized strengths. McMaster University, in cooperation with Mohawk College and others, is leading the way in fields such as materials science, additive manufacturing and process automation. “We like to work with companies large and small to find solutions to the problems they face,” said President Deane. Next Generation Manufacturing Canada, the entity responsible for operationalizing the supercluster, is headquartered at McMaster Innovation Park. Key Point: Industry-education partnerships focused on research, talent development and public policy are fundamental to the future of Canada’s Innovation Corridor as a globally competitive economic zone. 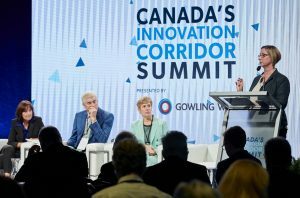 Canada’s Innovation Corridor Summit held this summer in Hamilton-Burlington featured a component on the future of goods movement in this region. A panel moderated by Daniel Rowe of Deloitte Canada looked at the topic through a multi-modal lens. 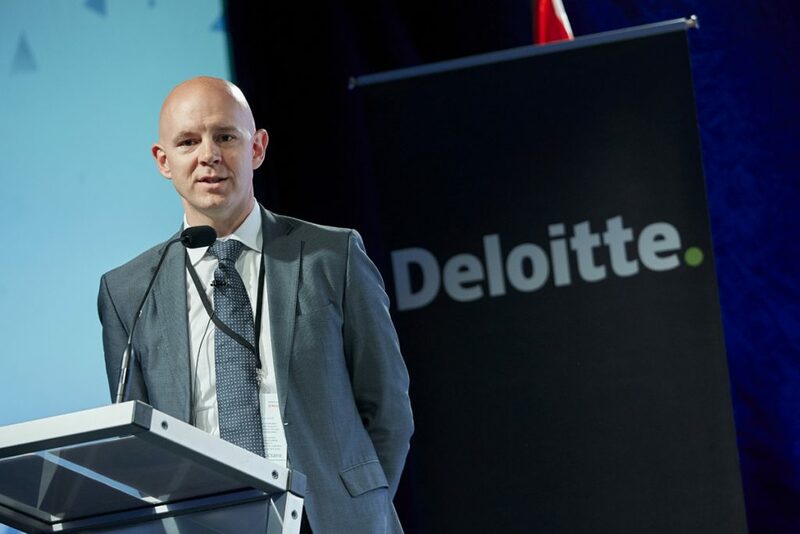 Daniel Rowe, Practice Leader for Monitor, Deloitte Canada, moderated a conversation on proposed bold solutions to improve goods movement in Canada’s Innovation Corridor. The panelists were Andrew Fuller, AVP Marketing and Sales, CN Rail; Ian Hamilton, President and CEO, Hamilton Port Authority; and Eileen Waechter, Director of Airport Planning, Greater Toronto Airports Authority. Photo by Mike Lalich. Listen to the Podcast and access the Movement of Goods report commissioned by the Toronto Region Board of Trade. The Challenges: Research has identified four key challenges to the efficient movement of goods in the corridor: Road congestion, land use conflicts (particularly near ports and along rail lines), last mile connectivity, and the need for a strategic vision. These challenges matter because movement of goods industries are responsible for more than one-third of all GDP and jobs in the corridor. Yet corridor-wide impediments to the seamless flow of goods — most significantly, road congestion ― hurt our global competitiveness by increasing the cost of business. Equally, they undermine quality of life. Select solutions to building a smarter, safer and more secure goods movement system have emerged through efforts coordinated by leading Chambers of Commerce and Boards of Trade representing communities across the corridor. Three Bold Solutions: A new report, commissioned by the Toronto Region Board of Trade and released at the summit, proposes three bold solutions to significant regional goods movement challenges: 1. Expand off peak deliveries as a prominent strategy to reduce morning and afternoon road congestion. 2. Promote the growth of Canada’s “transportation mega hub” based around Toronto Pearson International Airport and including links to road, rail and marine. 3. Unblock the Highway 401 bottleneck above Toronto by adopting innovations such as “upper deck” elevated laneways. The discussion panel commended the report’s visionary quality and emphasis on big ideas needed to drive transformational change in an era of same day delivery enabled by digital commerce. Embrace Innovation: Positive change on the journey to improved regional goods movement demands new ways of thinking and doing. To be effective, it must involve diverse stakeholders and multiple frameworks from different sectors. Hence the need for experimentation in areas ranging from transportation planning and technology to financing and governance. 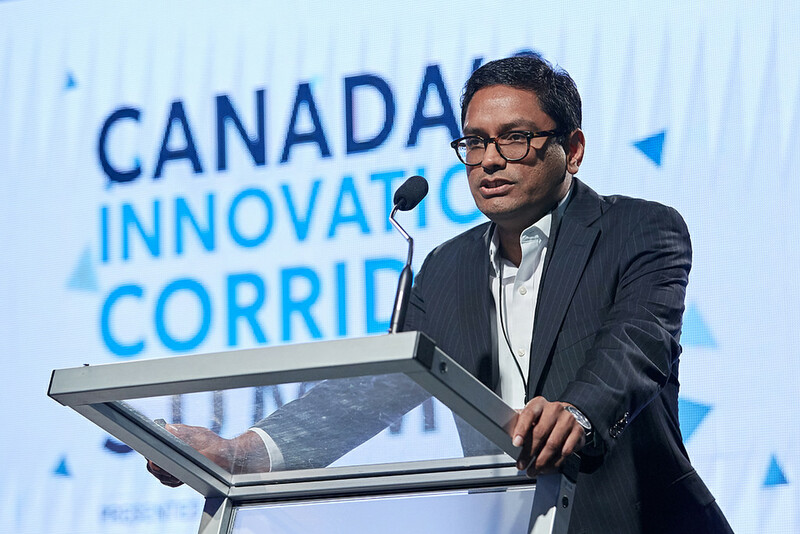 To this end, organizations such as Canada’s Innovation Corridor Business Council, are engaged in bringing the players together to imagine and implement the future of goods movement in Southern Ontario. 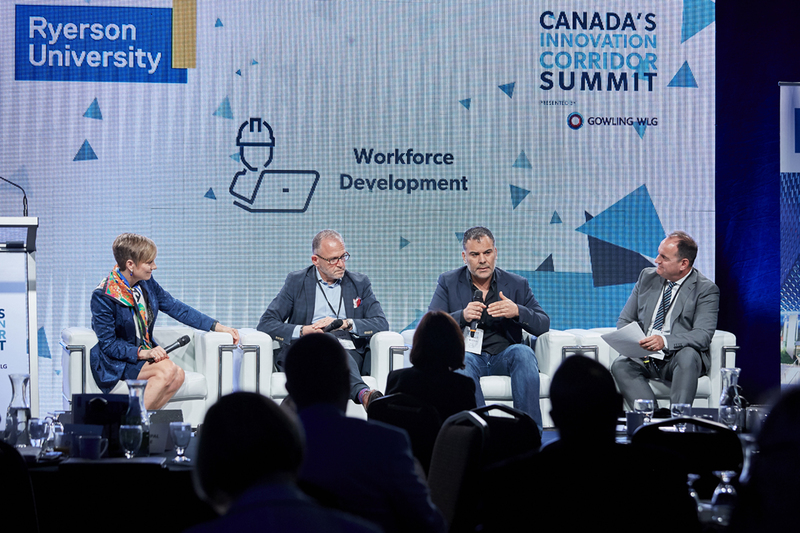 Canada’s Innovation Corridor Summit held this summer in Hamilton-Burlington included a focus on workforce development. Ryerson University sponsored an expert panel that explored ways to attract “awesome talent” needed to drive regional growth. CLICK to access audio recording of panel and accompanying slide deck. Symphonic Leadership: Changes in how value is created, exchanged and sustained in the modern economy demand a new style of leadership. “Symphonic leaders” establish and support a culture of collaboration. They model thinking and behaviours that enable people to work together across disciplines, sectors and geographies. And they create “social enterprises” that unite people around a purpose higher than making money. This leadership style — transparent, inclusive and outward facing — is magnetic to a generation of young talent eager to play a meaningful role in tackling the grand challenges of our age. It’s a prerequisite for building strong organizations throughout a globally significant innovation corridor. Transformational Experiences: Canadian colleges and universities at the forefront of workforce development linked to the needs of industry are committed to providing students with experiences beyond the classroom. This is demonstrated in the steady expansion of conventional apprenticeship and co-op offerings, and in the adoption of innovative programs, including project-based learning, fellowships and exchanges. It’s all about helping young people “learn by doing” through curated interactions with industry partners. These advances are helping make education institutions more “permeable” and open to opportunities to co-create jobs, prosperity and quality of life in cooperation with businesses and the wider community. For students — the drivers of Canada’s future economy — access to experiential learning, industry mentors and entrepreneurship programs accelerates the acquisition of “power skills” needed to flourish in life. Strategic Investments: Talent attraction and retention necessary for the ongoing success of Canada’s Innovation Corridor requires sustained financial investments in multiple areas, including international immigration and settlement services, support for postsecondary partnerships with industry, and aid for businesses devoted to workforce development. The corridor’s growing need to compete for global talent is a key reason to act. Canada’s Innovation Corridor Summit is an initiative of Canada’s Innovation Corridor Business Council. Guest moderator Avvey Peters, Chief Strategy Officer, Communitech (at podium) in conversation with panelists (left to right) Lynn McNeil, ChipCare Corporation; Bob Magee, The Woodbridge Group; and, Angela Pappin, ArcelorMittal Dofasco. Photo by Mike Lalich. Better Together: Canadian manufacturers large and small have embraced deep collaboration as a preferred business model. With a view to scale up and increase sales, particularly in international markets, domestic manufacturers recognize the need to work together in pursuit of global competitiveness. This means forming multidisciplinary partnerships to tackle the complex, costly and often risky investments central to the development and marketing of new products and services. The supercluster provides manufacturers with a platform to connect, share challenges and foster innovation. The benefits accrue to individual companies and our nation’s manufacturing sector as a whole. Project Implementation: The supercluster has amassed more than $800 million in private and public sector funding that over time will be applied to a variety of initiatives, including collaborative industrial projects. These projects, designed and implemented in response to manufacturers’ needs, span from digital factories and intelligent vision systems to breakthroughs in 3D printing and biotechnologies. The supercluster — which includes top colleges, universities and research institutes — will help Canadian manufacturers deploy leading edge technologies and processes essential in the age of Industry 4.0. Jobs and Prosperity: Manufacturing, supported by an array of technologies, services and start-ups, remains a significant part of the Canadian economy. The Advanced Manufacturing Supercluster will accelerate a “Made in Canada” renaissance leading to quality employment for future generations. This includes young people living in Hamilton and across Canada’s Innovation Corridor. Join the Learning Curve: A major role of the Advanced Manufacturing Supercluster is to accelerate learning during an era of profound technological change. Increased learning — especially through quality experiences repeated over time — can lead to improved performance and productivity. Access to learning opportunities made possible through a growing number of engagements among supercluster partners has the potential to benefit the world at large. It’s essential to reduce barriers to ensure that everyone can “get on the learning curve” and participate in the digital economy. The supercluster can channel the power of collaboration to support the most important skill in society — the ability to learn. Promote Colleges and Universities: Postsecondary education is central to the supercluster’s mandate to enable Canadian manufacturers to compete globally. Institutions such as Mohawk College and McMaster University routinely engage with companies in a variety of industries to co-create solutions to real world manufacturing challenges. Increasingly, these challenges are being addressed through the application of new technologies rooted in Industry 4.0 and fuelled by artificial intelligence. Colleges and universities active in applied research have become demonstration sites for emerging technologies poised to transform manufacturing. The aim is to help “de-risk” costly shop floor investments. Moving forward, the goal throughout the supercluster is to generate a “critical mass of activities” necessary for a step change in Canadian manufacturing. Facilitate Collaboration: The Advanced Manufacturing Supercluster — a partnership of more than 140 organizations — is well positioned to spark collaborative projects. Innovation in the digital economy relies on openness, trust and transparency. A secure database technology such as Blockchain would be an effective collaboration tool. Achyut Jajoo, VP & GM Manufacturing, Salesforce, explains the benefits of Industry 4.0. Photo by Mike Lalich. 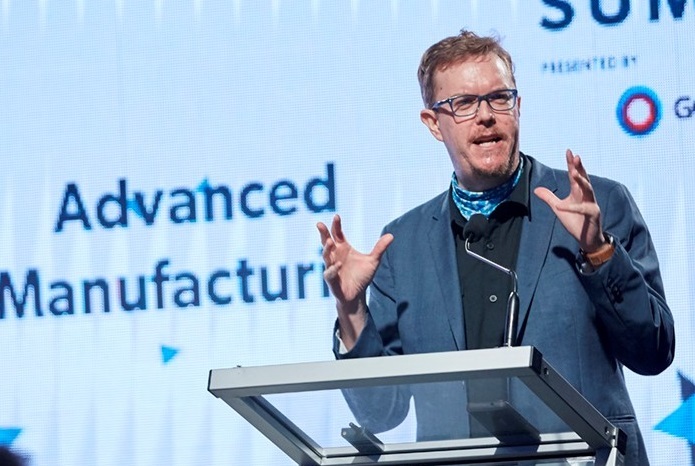 Canada’s Innovation Corridor Summit held last month in Hamilton-Burlington provided an opportunity to understand trends shaping advanced manufacturing. Leaders from Salesforce — the company behind the world’s top customer relationship management solution — participated in the program and shared the following insights. Fourth Industrial Revolution: We’re in a new epoch of growth driven by digital technologies. Advances in computational power, artificial intelligence and automation are fusing physical, virtual and biological worlds. New products and services are emerging. Old industries, slow to innovate, are in decline. This revolution — which offers the promise of jobs and prosperity — will produce winners and losers across the global landscape. Smart manufacturers, large and small, are embracing change and reaping the rewards. Data-Enabled Differentiation: Manufacturers that use Industry 4.0 tools have a competitive advantage. Through online sensors, digitally-driven companies can gather, analyze and share data in real time. Data, the fuel of the new economy, can be applied to engage employees, inform decision-making and enhance productivity. It can also help predict problems, such as a machinery breakdown, and trigger preventative maintenance. Perhaps most important, company data can be shared with partners up and down the supply chain and with customers. Manufacturers that make relevant data “transparent” are better able to develop innovative products and services attuned to marketplace needs. Demand for Talent: The fourth industrial revolution continues to affect labour markets world wide. Throughout Canada’s Innovation Corridor, demand is growing for graduates of engineering and technology programs that specialize in smart systems, and areas such as data analytics, robotics and additive manufacturing. Likewise, opportunities await talent with business development skills needed to drive collaboration, innovation and sales. The objective is to build qualified teams guided by a strategic vision that places customers centre stage.